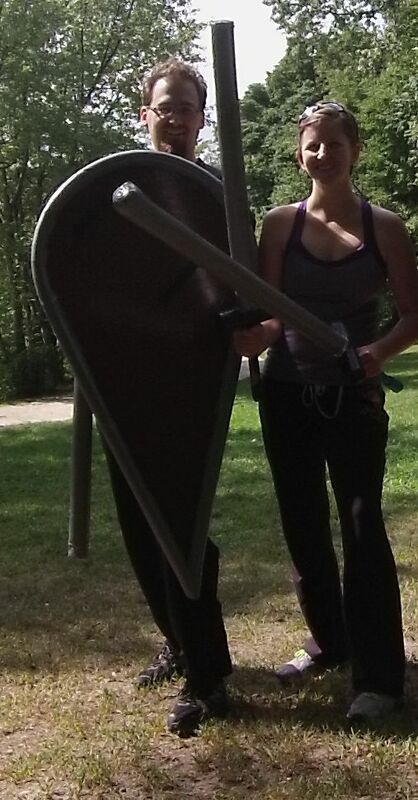 Are you interested in larp, but not sure where to begin? The traditional place to start is to find a few friends, build a few simple boffer weapons, some shields, and start fighting. Here is a really straight forward shield build. All but two the parts can be purchased at Home Depot. These instructions build a shield that should interact with weapons only. Contact should be weapon to shield only. Technically you could make shield to shield strikes, but that’s not a great idea for tactical reasons. This style of boffer shield should never come in contact with an opponent. The foam is too thin for shield to body hits. Basic knowledge of boffer sword construction is a good thing to have before starting this project. Some tools will be needed to make the shield. Tie the Pencil to the String. Mark the center of the curve of the shield. 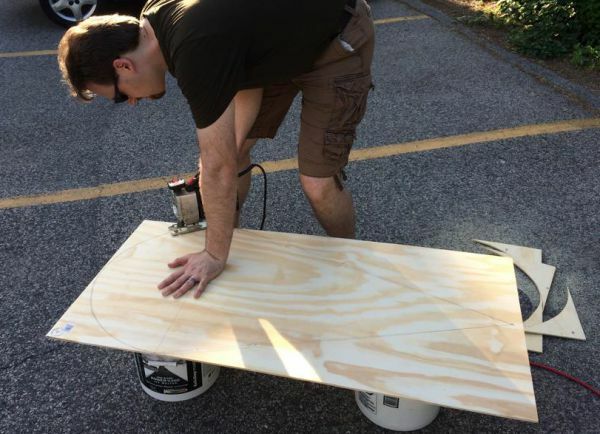 Use the string and the pencil like a compass to draw the curve of the shield onto the plywood. Now using the metal ruler draw the sides of the shield down to a point. You should have an outline drawn on the project panel. You can see the outline on the picture below. Image borrowed from http://www.yeoldegaffers.com and edited for size. Using the Jigsaw cut out the shield. Don’t worry if the lines aren’t perfectly straight, they will get covered with plastic tubing and pipe foam. Do make sure that they are mostly straight though. You wouldn’t want a lumpy shield. Before you can use the plastic tube, it has to be prepared by cutting a line down the length of the tube. It’s very difficult to tell how much of the tube will need to go around the shield, so cut the whole tube without measuring. This line doesn’t need to be straight at all, and in fact is almost impossible to keep completely straight. Do take care that the seam you make isn’t too wild. It’s usually easiest to cut the inside wall of the tube in a spiral. Start with one end of the tube at the point of the shield. Use strapping tape to attach the tube to the shield. Picture is duct tape, that works as well. It’s has more adhesion to the wood and the tube, but can break down a little quicker. Strapping tape is far more rugged, but doesn’t stick as well, so you need more of it. Use long strips of strapping tape, and space them every few inches. If you’re using duct tape, the spacing shown is fine. The pipe insulation will have a seam, you may have to prep the foam by cutting the seam. Once cut, start at the pointed end of the shield and attach the foam all the way around the edge of the shield. Ideally one piece of foam will go all the way around the edge of the shield. This is why you want the really long pieces of pipe insulation. A note about the pointed end of the shield. In combat, this will generally be pointed at the ground, and won’t come in contact with the other player… But in mass combat weird things happen. Other players often fall onto the ground. You could trip and fall. There are all kinds of things that could happen. So it’s better to be safe than punctured. Build a ‘safety tip’ of sorts onto the end of the shield. When adding the foam, use enough that there is an inch to two inches of foam, with nothing inside it at the pointed end of the shield. Tape the edge of the shield. In an idea world we would use one or two very long pieces of tape to apply a surface as thin as possible. Like a sword blade. But as the shields are curved it would be almost impossible to do this. Instead use many pieces of duct tape arranged side by side. Try to overlap the tape as little as possible. A little overlap is desirable, as this make a more water resistant shield but too many layers of tape will make the edge of the shield hard. Using this diagram I figure out roughly where the holes need to go for the straps. The angle of the grip is important, but many of the other distances are going to be completely different due to length of your arm, the size of the shield, the curvature of the top of the shield. Instead of measuring you really can just estimate the location of the strap by laying your arm down on the shield, and marking where your palm and mid arm are on the shield. If you plan on wearing gloves and or a gauntlet, measure those distances with the gear on. Figure out where you want the straps to be located, then mark those points. Using the width of the strap you’ve acquired, mark the width the strap. Then drill two holes, one at each end. Next you have to carve or file out the area between the two holes. My jigsaw blade was too wide to fit in the holes so I used a pocket knife, and it was no fun. A rasp or rough file will work much better. A quick note. This step should probably be done sooner. Probably right after cutting the board. I did this later in the process, not for any good reason, but just because I didn’t think to do it sooner. This is critical. You want the straps to be tight so that you have control of the shield. But to be tight your arm has to be pressed up against the back of the board. Which means the bones in your arm will grind against the wood. This is not good. You need some kind of padding between your arm and the board to prevent bruising. Wearing gloves and a gauntlet might be enough, and if you know you’re always going to use them you can skip this step. For anyone who wants to use their bare arm you need padding. For my shield I’ve added two layers of camp pad under my wrist, and a single layer of camp pad farther up my arm. They are simply duct taped to the shield. But you can use DAP if you prefer. They don’t have to be pretty, nor perfect. They just need to protect your wrist. For my shield I used 4 inch wide brown duct tape. Apply many rows of 2 inch wide tape takes forever. The 4 inch wide tape worked really well and very quickly. If you want an odd color or higher resolution use the 2 inch tape. It seems kind of ironic that I am covering over wood, with a brown duct tape to make a wood colored shield, but the finished shield looks pretty great. FYI, shields with bare plywood don’t actually look that good. And they get dirty fast. This black boarder is made of electrical tape and looks really nice. Unfortunately it fell off really quickly because electrical tape is not the most adhesive product in the world. Ah well. The boarder covers the seam between the brown duct tape and the silver. I might DAP the electrical tape back on. That would keep it stuck! If you make some Boffer Shields using this guide I would love to see pictures. If you improve the steps or have a great trick let me know in the comments. Send a tweet, or hit me up on Pinterest.